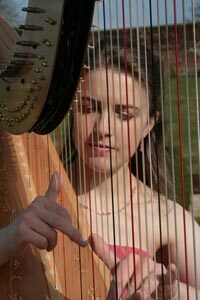 The harp adds a touch of class and elegance to corporate events. It sets the perfect ambiance subtly in the background. Anna has performed for a wide range of corporate clients including Deloitte, Drummond’s Bank, KPMG, BP and the Royal Bank of Scotland. Anna has studied at both Leeds and Birmingham Universities. 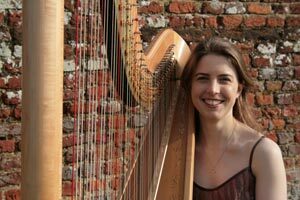 She achieved a BA (hons) in Music and English plus a MMus in Performance. After finishing her studies Anna has been busy as a freelancer in the UK and abroad. She has recently performed for the Lord Mayor of London, the Prime Minister, Princess Anne and the Princess Royal. She has performed at various venues through the UK which includes the Albert and Victoria Museum, Tate Britain, Althorp House and the Savoy Hotel. She debuted at BBC 3 Radio and Purcell room with James Bowman, Peter Medhurst, Linda Howarth and Carol Wells in 2004. Anna has also appeared with film director Ken Russell in the BBC Television Series ‘A Picture of Britain’. Her performances are regularly at functions and venues in the UK, but she has also traveled abroad regularly. She played with the Orquesta Sinfonica de Tenerife, Orquesta Filamonica de Gran Canaria, Southbank Sinfonia and Britten-Pears Ochestra. Mozart’s Flute and Harp Concerto on a number of occasions.